Every species has an appreciation for water, mostly because we all depend on this powerful element for survival. Water recreation is also the go-to option for family fun this summer; it’s even more enjoyable with your splash-loving dog. To help ensure a rip-roaring good time, we’ve compiled the latest pet wellness tips and water safety. Early exposure to water play is recommended. Try gradually increasing swim time and depth once your pet displays confidence and ability. A fitted personal flotation device is quite possibly the single most important item your pet needs this summer. Without a high-quality life jacket, your pet could be at risk of drowning – even if you consider him or her to be a strong swimmer. There are dogs who are simply built for swimming and retrieving in the water, but that doesn’t mean he or she should go unsupervised. Always keep a close eye on your intrepid canine while he or she swims or plays on the water’s edge. Assign someone else to watch if you need to step away. Boats are popular for a reason, and most dogs enjoy time spent floating – or whizzing – around the water. Be prepared with extra paper towels, doggie bags, and a pet first aid kit. We also like the idea of a doggie ladder to make it easier for your dog to safely exit the water. Be sure to bring extra fresh water for your pet, and discourage drinking directly from a lake or river. Additionally, we advocate for the leptospirosis vaccination to protect your pet from leptospira bacteria. High temperatures can be extremely dangerous, even if your pet stays cool in the water. Enforce water breaks and regular rest time in the shade to minimize the risk of heat stroke. On the other hand, deep water can be too cold for your pet. A good rule of thumb: if it’s too cold for you, it’s definitely not acceptable for your pet. River beds and lakeshores can be full of refuse. Broken glass, discarded fish hooks, fishing line, and sharp shells or rocks can place your pet in a world of hurt. Parasites and bacteria are seemingly everywhere. Make sure your pet’s parasite prevention is current and his or her vaccinations are up to date. A full day of sun can be exhausting. Before you crash, hose down your pet and thoroughly dry his or her ears. 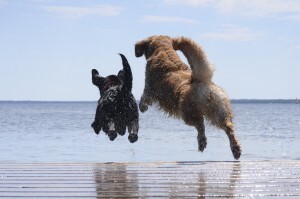 Pets and water safety may seem tough at first, but with these strategies in place, you and your fur friend can relish the summer together. Please let us know if you have any questions or concerns. Our veterinarians and staff are always happy to help. Happy summer!